La leyenda de las Fuerzas Acorazadas Soviéticas, siendo el carro más fabricado de la SGM, con un total de 33 805 vehículos fabricados. Se produjeron tres variantes de este modelo en varias fábricas soviéticas desde 1940 hasta 1944. 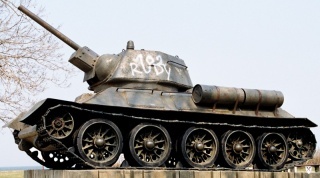 An iconic tank of WWII, and having a mythic reputation on the battlefield, the T-34 is not as godly as in real life, but is more than average for a tier 5 medium. It's 57mm Zis-4 gun has great penetration and DPM, allowing the tank to rip apart enemies quickly. The mobility is average, and the armor, while angled, cannot be relied upon. 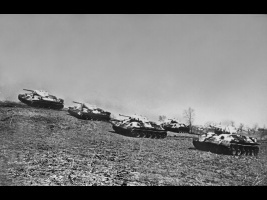 The T-34 leads to both the tier 5 soviet TD, SU-85 and medium, T-34-85. Adaptable tank due to DPM, mobility, etc. The Soviet counterpart to the American M4 Sherman medium tank, the T-34 shares the M4's status as a Jack-of-All-Trades. The T-34 is a versatile tank, offering good firepower, decent armor and HP, and good mobility. Stock, it is a pretty bad tank, armed with the underwhelming 76 mm L-11 gun previously used on the A-20. The stock turret and engine lack performance in tier 5. However, once upgraded, this tank can easily command the battlefield. 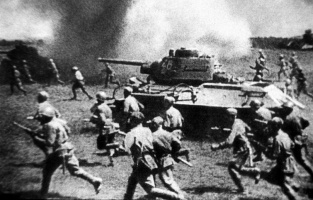 Asides from the L-11, the T-34 has a choice of three guns. The 76 mm F-34 is a good improvement over the L-11 with much better DPM and penetration, in addition to added accuracy. 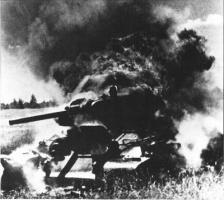 The 57 mm ZiS-4 is generally considered the best gun on the T-34, with the best penetration, accuracy, rate-of-fire, and damage-per-minute of all the guns at the cost of low alpha damage. It is more than capable of dealing with any Tier 5 tank, and is powerful enough to penetrate the sides and rear of the heaviest Tier 7 tank the T-34 may face. The Enhanced Gun Laying Drive is almost mandatory with the ZiS-4, for the aim time is longer then the reload time (even without the Medium Caliber Tank Gun Rammer) and it will dramatically improve the T-34's ability to snipe at long ranges. The ZiS-4's primary strength is in its ability to perform well both at long range and in close combat. The 76 mm S-54 has been buffed to match the American M1A1 gun in penetration, but the poor rate of fire and somewhat long aim time make it less than ideal in most circumstances, since unlike in PC, it does not feature better alpha damage than the other 76mm guns, but compared to the F-34, has much better penetration. 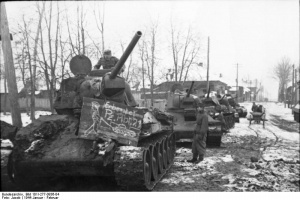 In terms of mobility, the T-34 has the best top speed of the three main Tier 5 mediums (the M4 Sherman, and the Pz.Kpfw. IV). 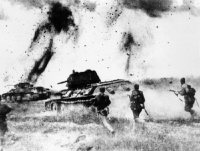 The acceleration and turning are not quite as good as that of the Pz.Kpfw. III/IV, but they are good enough to allow the T-34 to perform well as a flanking medium and even circle most heavy tanks. The T-34 mod 1943 Suspension is inexpensive and offers a massive improvement to terrain resistance, improving your speed more than the engine upgrade. 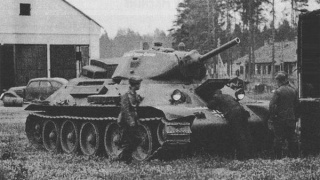 The T-34 was developed fr5�׹he BT series of fast tanks and was intended to replace both the BT-5 and BT-7 tanks and the T-26 infantry tank in service.